Crystal Mozart is the first ship in Crystal River Cruises' fleet. It sets the standard for a new kind of luxury river cruise experience, one focused on the highest level possible of amenities, service and experiences and that seems more akin to some of the smallest ocean vessels rather than its riverboat brethren. Yet in some ways, it's a one-off, given that the fleetmates that follow it will be newer and smaller vessels, carrying fewer passengers. 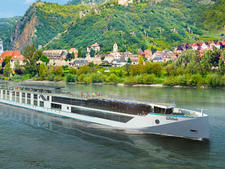 The now-154-passenger riverboat started life as River Mozart, sailing for Peter Deilmann as Europe's largest riverboat. (At 75.1 feet wide, it's double the width of the typical European riverboat and can really only navigate the wider locks of the Danube River between Passau, Germany, and Budapest, Hungary.) Crystal stripped the vessel to its steel and built it back up to offer more spacious suites, bring more light into interior spaces and outfit every space in a stunning contemporary design. A gift shop was removed to create an additional dining venue; cabins disappeared to make room for an elevator. Compared to more recently built river ships, Mozart's exterior does not have a wow factor. You need to go inside to be impressed, both with the look and amenities, as well as the amount of work Crystal put into reimagining this old ship. You also can't view service from the outside, but the line offers a crew-to-passenger ratio of approximately 1:1.7 -- that is, 92 crew members are on hand to take care of just 154 passengers. Crystal thought about what today's luxury traveler expects and desires in a vacation, or in a home even, and tried to incorporate those things into the ship. Passengers have plenty of choice; whether it's the option of three dining venues plus a snack station and room service, or deciding among several complimentary tours and a few more extra-fee ones in every port. Separate spa, salon and fitness center spaces put most other river ships to shame in terms of size and style. High-tech amenities are everywhere, from interactive TVs to iPads in every stateroom and customizable toilets. No one's forced to adhere to a schedule; dinner is truly open seating, allowing diners to arrive at any time during operating hours, and tours depart in the morning and afternoon. Food is farm-to-table -- locally sourced from farms within several hours of the ports. The ship's interiors are just stunning. Thought was put into every space. Instead of a short dividing wall, you'll find a metallic work of art that effectively carves up a room. A faux fireplace (which uses water mist and LED lights to create the impression of flames) gives atmosphere to a sitting area at the top of a stairway. Cool, modern rocking chairs balanced by circular hanging lights provide seating by the indoor pool. Beanbag chairs and more angular patio chairs provide pops of color to the top deck, while a living garden of herbs and plants add some life to the alfresco lounge space. The ship won't fail to impress, but aspects might not be to everyone's taste. Some might find the cabins to be too high tech. Do you really need to choose among five different lighting options when you're tired and just want to smack a light switch on? Do you want to spend the first two days of your cruise trying to figure out how to stop your toilet from automatically opening every time you walk by? And while it's appealing to have the choice of multiple dining venues, we were underwhelmed by the number of menu options at every eatery; with the exception of the main Waterside Restaurant, all other restaurants have fixed menus that do not change from day to day. A king-size bed may be luxurious, but is it really necessary when it makes it difficult to open closet doors and move from one side of the cabin to the other? While you can certainly nitpick, the truth is that with Crystal's highly trained staff -- coming from the ocean ships, as well as European luxury hotel and riverboat veterans -- and their desire to treat you right, a wonderful Danube itinerary peppered with exclusive shoreside experiences and overnights in port and a plethora of onboard amenities, Crystal Mozart is an excellent choice for anyone looking to experience a river cruise in total luxury. A large percentage of Crystal Mozart passengers will be Crystal's loyal repeat customers. The line is hoping to reach high-end travelers who have been waiting for a truly luxurious riverboat to appear before booking a first river cruise or even first cruise of any kind. It's hoping that active shore excursions, high-tech amenities and farm-to-table cuisine will attract a younger demographic than is generally seen on other river cruises. Cruise Critic’s professional photographers and our extraordinary community members have taken 566 pictures of Crystal Mozart. When you visit our photo galleries, you can be assured that what you see is what you get. Crystal Mozart's dress code is casual during the day and a dressier version of casual at night. Wear clothes appropriate for your shoreside activity -- especially comfortable shoes if you'll be walking a lot or navigating cobblestone streets. During the day, swimsuits, cover-ups and baseball hats are not permitted in the Waterside Restaurant. At night, men do not need a tie and a sports coat is optional. They should pair nice trousers with a button-down or collared shirt. Women should look nice in a dress, skirt or slacks and cute top, but do not need more formal attire. However, if you choose to have dinner in port, check the dress code of your booked restaurant as more formal clothing (such as a suit and tie) might be required. The onboard currency is the euro. Gratuities are included in your fare for onboard staff, including butlers, bartenders, waiters and housekeepers. Additional tipping is not expected. Your fare also includes unlimited soft drinks and alcohol (including wine and spirits) throughout the ship; cabins stocked with unlimited soft drinks, beer and bottled water; meals at all restaurants including 24-hour room service and the self-service drinks pantry; at least 60 minutes of free Wi-Fi per person, per day; and airport transfers to/from the ship on embark and debark day. Crystal river passengers also do not need to pay for daily yoga or fitness classes, self-serve laundry, select shore excursions in every port, in-port Michelin-starred culinary experience in select destinations, use of Nordic walking poles and audio headphones on Crystal's tours. 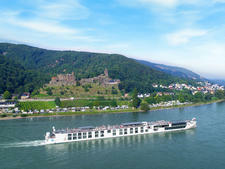 Along with its sister luxury river ships, Crystal Debussy sails the Rhine, Main and Danube rivers. The 135-meter vessel debuted in April 2018. Crystal Mahler joined Crystal River Cruises in 2017 and accommodates up to 110 passengers in cabins that range from 220 to 750 square feet. Launched in 2017 as one of four new-builds in Crystal River Cruises' fleet, Crystal Bach will sail with its twin sister, Crystal Mahler. Crystal River Cruises will welcome the line’s new-build Crystal Ravel in Spring 2018, carrying up to 106 passengers in luxurious accommodation.